The colours of the setting sun above Newlyn Harbour are a sign that it’s time for sardine fisherman David Pascoe to take his crew out on the ocean. Together they sail a small purse seine boat to Mount’s Bay, looking to catch the most beautiful, fatty sardines of the British waters in a sustainable way. That way David contributes to our mission to ensure we can enjoy fish now and in the future. David and his crew take off from Newlyn to Mount’s Bay about 45 minutes before dusk. Shortly in advance the schools of sardines get located using a sonar system and any conditions that might tribute to the catch of the day are being checked out. The sardines, that swim in big schools and are lured to the surface by lamp light, get buried under a net. The bottom line of the net gets attracted which creates a kind of bag from which the fish can no longer escape. 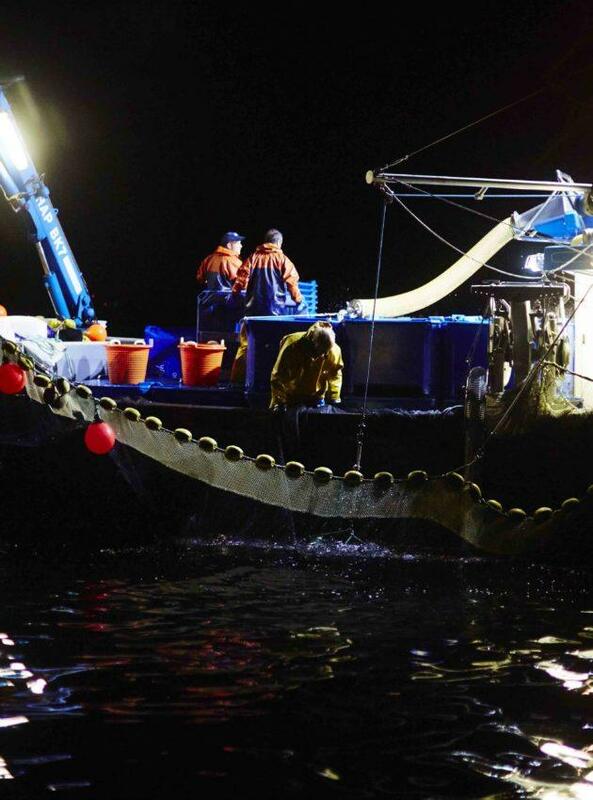 It’s already in the middle of the night when the net gets pulled up onto David’s boat. With another net the fish gets scooped out and thrown into the hold of the ship, where it stays fresh until David and his crew return. David’s Cornish sardines are tender, fatty and delicious from the grill!